Jacob's Soap Box » Blog Archive » Abrahamic What? You must give it to them, them the politically corrupt industry, how so elegantly they snuck this one on us whilst we were daydreaming, this new term Abrahamic Religion rolled of the production line. No ceremonies, no ribbons snipping, it just appeared in the middle of the day, as if it was always there, no explanation needed. The idea is simple. Islam, that despite movies such as Arabesque and Lawrence Of Arabia, has acquired some image challenges over the years, particularly when some people in the West got the opportunity to examine it closer. In order to meet its image deficiency Islam needed that something which would finally convince us all that it is not just another religion, but that we, who the Koran call the followers of the book, are part of Islam and Islam is part of us, Kumbaya. The basis for this whacky PC idea is that as Muslims believe that Arabs, thus Muhammad, are descendants of Ishmael (Ismail in Arabic), Abraham’s son to Hagar, they too are part of the extended Judea-Christian family, thus all we need is a new bumper sticker, brilliant! Upon the anniversary of the birth of Jesus, Son of Mary, the Word of God, the Messenger of mercy, I would like to congratulate the followers of Abrahamic faiths, especially the followers of Jesus Christ, and the people of Britain. The travesty of a need for “reply” to the queen Christmas massage, by whom, and the use of Abraham tells it all. The Abrahamisation of Islam into the Jodeo-Christian religions is a product of the PC, multi-culti brigade and it has nothing to do with religions, Christianity, Judaism or Islam for that matter. It is simply a feel good term. Let me be clear, I do not question Muslim’s beliefs about Abraham, this is not the issue. The issue is the use of Abraham for politically correct reasons. There is no such things as Abrahamic Nation, Abrahamic Religion, Abrahamic Nation or Abrahamic anything for that matter. The term Abrahamic Religion was coined by the political corrupt multicultural brigade with the active support of the useful idiots of Islam to create an impression that somehow Islam belongs in the Jodeo-Christian groups of religions – IT IS NOT! One would not like to use harsh terms such as “disagreement” or, God forbid, “dispute” when it comes to warm feeling on the inside, thus I shall use some UN language innovations and point out some divergences between Judeo-Christianity and Islam. The Bible also provides us with a continuing chronological events time-line between Abraham and Jesus, something which does not show up in Muhammad’s curriculum vitae (CV). Instead, Ishmael, whom I will discuss further down below, disappeared from the biblical tales, only to resurface, some two thousands year later with a me too story. Believe the Bible or believe the Koran it is still a divergence no 2. Believe it either way, it is still a Divergence No 3. From father to son. Muslims believe that Ishmael is the patriarch of all Arabs. Muslims also believe that Ishmael, not Isaac was the subject of God’s test of Abraham’s faith by asking him to sacrifice his son. Muslims celebrate it with the Festival of Sacrifice (Eid Al Adkha) which marks the beginning of the Hajj, the pilgrimage to Mecca. Isaac or Ishmael? Believe in what you may, it is still divergence no 4. Now let’s turn to Ishmael’s mother, Hagar (also Agar and Hajar). The most striking point about her is that the matriarch of Islam is not mentioned in the Koran! Not even once! (As a matter of interest, Jerusalem, the third most holy city to Islam, does not get a mention in Koran either). According to the Bible, Hagar was EGYPTIAN maid of Sara (Abraham’s wife) who bore Ishmael to Abraham, because Sara was barren, or so the thought. After Sara’s miracle birth to Isaac, and at here behest, Abraham sent Hagar and her son away. Not only his mother was Egyptian but Ishmael also married an Egyptian woman. In other words, the two most important women in Ishmael’s life, his mother and his wife were Egyptian. (Comment: For some reason the St James version of the Bible, translates the Hebrew word midbar as wilderness., this is incorrect. I use correct word for midbar which is desert ). The name Paran appears in the Bible a number of times. The spies that Moses sent to explore on the promised departed to their mission from the Paran Desert. The exact location of Paran Desert is not known for certain but it is most likely somewhere between the Sinai Peninsula and the Negev in Israel of today. 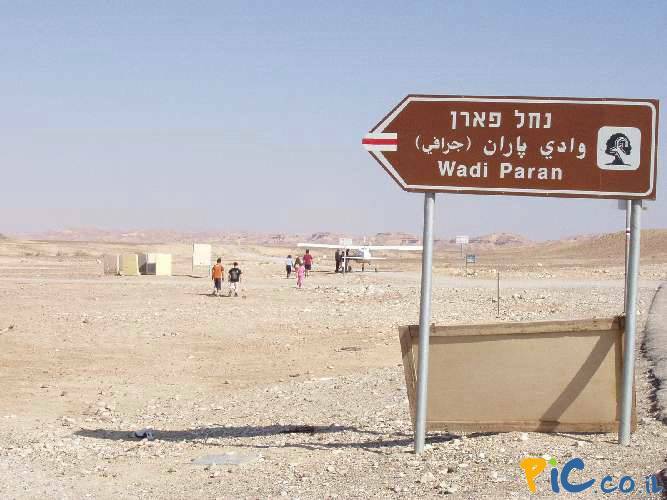 Wadi Paran (wadi is Arabic for “dry creek”) that runs from the centre of the Sinai Peninsula into the Arava plains between the Dead Sea and the Gulf of Eilat (Gulf of Aqaba) in Israel may give us some cluse as to where the Paran Desert might be found. Horeb (Khorev) is a mountain near Mount Sinai or another name for Mount Sinai. Kadesh-Barnea is one of he places the spies went through their tour, it is said to mark the most southern point of Erez Israel (the Land of Israel) which out it at shores the Red Sea, near Eilat of today. Although none of this give us a precise position of the Paran, it has as much chances as being anywhere near Mecca as being near Sydney, Divergence no 6. In UN speak six counts of divergences must counts as isolation, UNophiles love the word. Ask all the haters of America and Israel. If you understand UN speak you would know that being isolated is worse than being called Holocaust deniers but I am digressing now. I guess that by now you cans see how ridiculous, this Abrahamic thing is. Above all, had Islam recognised the other Abrahamic religions as being part of the family, there would be no infidels; oh well, may be a few Hindus. If we are all in the same Kumbaya, who are those people that the Koran call the follower of the book? Not once or twice, we the followers of the book get 34 mentions in Koran. Wow that is 34 more times than the words Jerusalem, Hagar and Abrahamic religions appear in the Koran. This entry was posted	on Sunday, March 1st, 2009 at 2:50 am	and is filed under Islam & Terror, Multiculturalism. You can follow any responses to this entry through the RSS 2.0 feed. You can leave a response, or trackback from your own site. Interesting article. I just wanted to questions to think about? Why would God test’s Abraham’s faith by asking him to sacrifice Ishmael and not Isaac? Ishmael was his first son. He was born to Abraham in his old age. Isaac was born 13 years after Ismael. When Isaac was born, Ishmael was of an age where he was old enough to accompany his father, and help is almost 100 years old week father. Not only this, but Abraham was asked to exile Ishmael to live in the desert. Something which he did not wanted to do if it wasn’t for God’s order. Abraham loved Ishael as much as he he loved Isaac. but Ishmael was the first, the older, the helper and the exiled. God wanted to test his faith to see who did he love the most, him or his son. Thus logic and reasoning says it must’ve been Ishmael that God had ordered Abraham to sacrifice. Was Abraham a hebrew or a muslim? Being a hebrew is an ethnicity. Being a muslim is someone who submits to the Lord almighty. That is why Abraham and all the prophets were muslims because they all submitted to God almighty. How did these prophets pray? They kneeled and prostrayed to the lord. Why because they submitted to the Mighty, that is they were muslims. Muslims are the only people who follow Abraham and the rest of the prophets, because thet washed before prayers like them and prayed like them. Is Jerusalem mentioned in the Quran? In fact it was the first “Qiblah”. Meaning, muslims were asked to pray facing the Farthest Mosque in Jerusalem, which God had blessed as he tells us in Chapter Al Israa in the Quran. And God kept his promise and made Ishmael a great nation, the nation of Islam. Powered by WordPress v 3.5.2. Page in 0.276 seconds.